Since we know that procurement of raw materials and parts is the largest contributor to greenhouse gas emissions by studying the amount at output at each stage, we have been working hard to cut down the input of resources so as to reduce the corresponding emissions. Emissions due to the use of Ricoh products are equivalent to emissions from the business sites. Taking that into consideration, we are improving energy efficiency of our products. Scope 3: Other indirect Greenhouse Gas emissions from a variety of activities conducted by supply chains related to the reporting entity, ranging from the production of purchased materials to transportation/use of products and waste disposal. * Third-party verification has been conducted for Scopes, 1, 2 and 3 (limited assurance). The products subject to accounting consist of copiers/multifunctional copiers, printers, production printers, digital duplicators, facsimiles, peripheral equipment, office equipment supplies (including toners, toner cartridges, copier paper, etc. ), digital cameras, electronic devices, embedded modules, thermal media, gas alarms, projectors, video conference system, and LED lighting. 59 thousand tons of iron and 51 thousand tons of resin in the procurement of raw materials and parts, including 2.6 thousand tons and 2.4 thousand tons of recycled materials (managed under the resource conservation targets of products) respectively. Greenhouse Gas emissions coefficients are calculated according to the original database* developed by our company. Regarding the amount of chemical substances handled, discharged and transferred, data on substances covered by the Japanese PRTR Act is collected from the Group’s sites inside and outside Japan. Tabulated environmental impact data obtained from individual sites is separately provided on our website. Data for Japan covers transportation of cargo shipped by Ricoh or our sales campany, Ricoh Japan. For data outside Japan, international transportation as well as some transportation within the same area/country is also subject to the calculations. Products subject to accounting include copiers/multifunctional copiers, printers, production printers, digital duplicators, facsimile machines, projectors, video conference/web-based conference systems, and LED lighting. For calculations, regional greenhouse gas emission coefficients (kg-CO2/kWh) for electricity that are latest available are used. To promote reuse business, keep track of the collected tonnage of used products including copiers and toner cartridges, not only in Japan but worldwide. 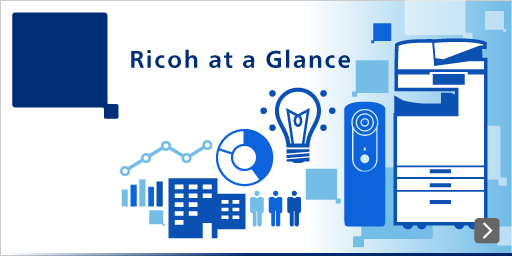 The Ricoh Group is aware of the importance of lifecycle environmental impact evaluations and has adopted its own accounting method that incorporates a lifecycle perspective in the early stages. To step up its efforts, the Ricoh Group revised the accounting method in fiscal 2012 in light of the Scope 3 accounting standard of the Greenhouse Gas Protocol Initiative, which is an international accounting guideline. Previously, we recorded paper used for Ricoh’s products in the Use stage. However, we have changed the accounting method and now recognize paper that is purchased and sold by the Ricoh Group in the procurement of raw meterials and parts stage. Previously, we calculated electricity consumption from copiers/multifunctional copiers and printers using the Ricoh Group’s own calculation method (taking into account actual usage conditions and whether or not an energy savings mode (10-second recovery time) was employed). However, we then adopted a new method that uses TEC values in accordance with the measurement method of the International Energy Star Program. We also made estimates for a number of products operating in the market based on the model of products sold in the past five years. However, we have since employed a new model that products sold each year shall be operating for five years. Regarding the reporting of LCA data, we previously used inventory analysis results and integrated impact assessments. But to provide more comprehensible information, we have adopted a new method starting in fiscal 2012 that indicates environmental data directly related to business activities at the Ricoh Group’s sites while, for our supply chain companies, provides data on Greenhouse Gas emissions indirectly related to the Group’s activities (according to Scope 3) as well as the amount of resources and energy used at each stage. The amount of Greenhouse Gas emission reduction is indicated in the Output, which was achieved by using Certified Emission Reductions (CERs). We have changed the calculation method in the way described above but we still believe that we can do more to further reduce environmental loads effectively. We will continue to explore that possibility while checking moves of external entities concerning the Scope 3 calculation guidance and so on. To calculate Greenhouse Gas emissions arising from the Procurement of Raw Products and Parts and Use stages, we use data prepared by Mizuho Information Research Institute, Inc. based on the LCA database (fiscal 2009, version 2) published by the Life Cycle Assessment Society of Japan (JLCA). Mizuho Information & Research Institute organized the data by expanding the system's boundaries and supplementing missing data.